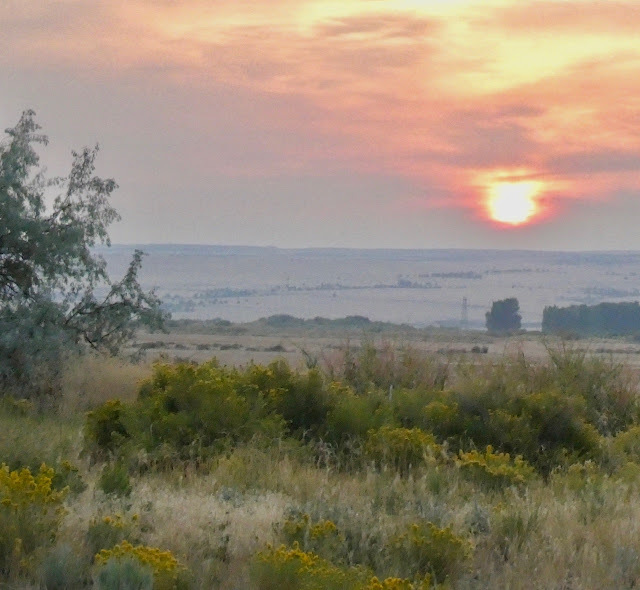 Smoke made for a fiery dawn if not a view of Steens Mountain. Frenchglen, Eastern Oregon. Even early morning, the Steens Mountain view still eluded us, secreted away in the eye-tingling, throat scratching, smoke-tinged air. It was time to move on. 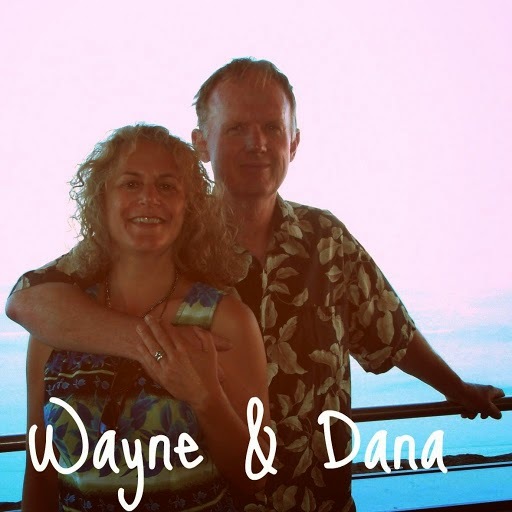 In a week, Wayne would be starting work in Florida. Our destination for the day was the base of the Wasatch Mountains, in the Salt Lake City, Utah area -- a reasonable halfway point between Frenchglen and Larkspur Colorado, where my brother and his wife live. 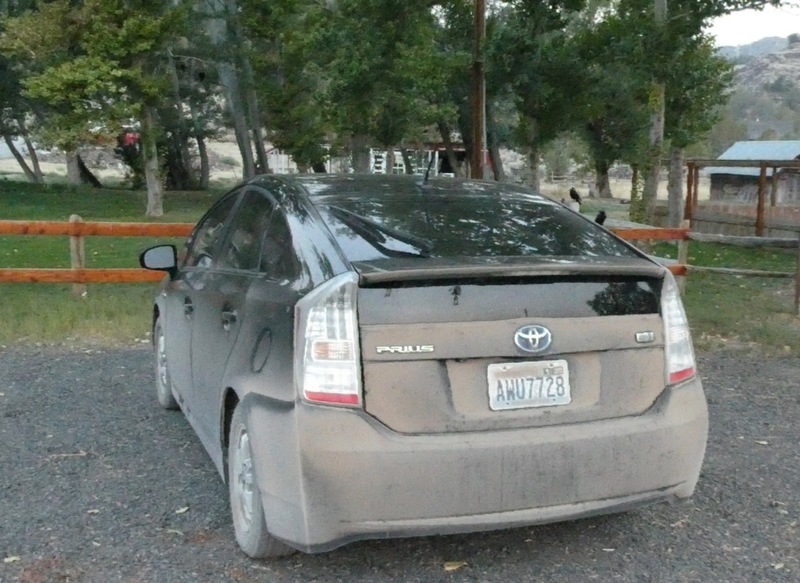 My car was a bit worse for the wear traveling the unpaved roads into the Steens the night before. We stopped at the first car wash we could find... which was a good ways into the day, in Winnemucca, Nevada. We bid this desolate stretch of Oregon goodbye... Highway 140 is populated more by power poles than people or trees. Before long we found ourselves crossing the border into blink-and-you'll-miss-it mining town of Denio Nevada, which reaped the rewards of liberal liquor and gambling laws "just across the border" as well as offering the delights of fishing and hot springs. Denio's current population is less than 50. Denio, Nevada. A bustling border town. Not. We passed rapidly through long stretches of sparsely populated country... predominantly dessert-like grasslands, punctuated with buttes and mesas, the ocaissona cattle ranch and farm. We wondered what stories the dilapidated farms and shacks could tell us. 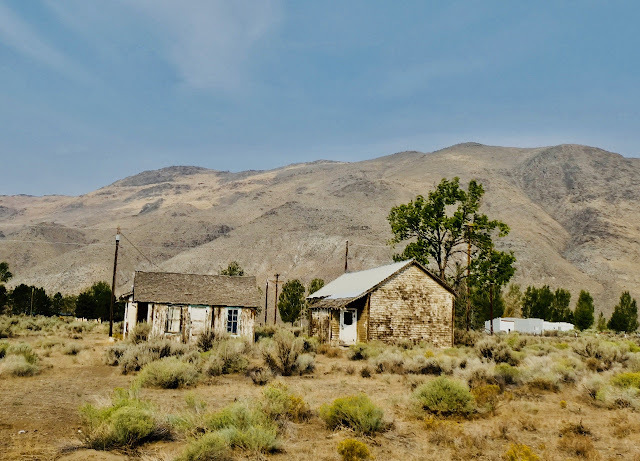 Shacks in Denio, Nevada. They looked like they'd been there a long time. The town was settled in 1885. The towns were tiny and far flung. If American flags were an indication, pride in our country beat as strongly in the hearts of those who lived there as the harsh sun beat down on the prairies and Badlands. Still, driving through Australia struck us as more desolate and isolated. In the US, there was more homesteads and ranches (even if some looked abandoned for decades), and more trucks on the road. The spaces between places were far more vast in Oz. We stopped briefly in the historic town of "one moccasin" Winnemucca, where we finally found a car wash, grabbed gas and groceries. 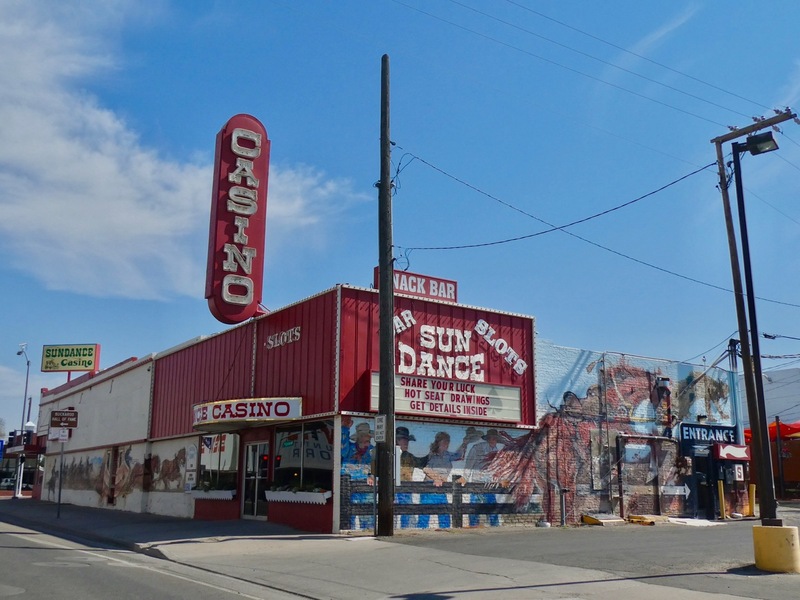 Casinos, built long before Indian reservations began building them as tribal money-makers, served a reminder that Nevada is the only place in the country where the oldest profession in the the world is still legal. Not much sign of life on Monday morning when we cruised past this kitchy little casino in Winnemucca, Nevada. It's the big town and county seat of Humbolt county, town population 7,000-something. At Winnemucca, we regretfully left those more personable two-lane highways and quirky tiny towns behind for burning miles on I-80, still seeking curiosities where we could find them to alleviate the boredom of too many miles in too short a time. In Nevada, for example, we couldn't figure out why there were three beautifully built overpasses to nowhere. It was obvious they were built in recent years, and at substantial expense. 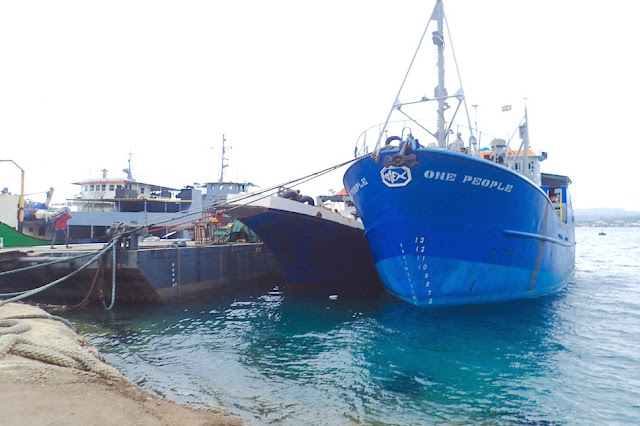 Were they pork barrel political projects? With some Googling, we eventually discovered the overpasses's purpose -- to provide a safe crossing for wildlife, reducing traffic fatalities for both humans and 4-legged creatures. Each year in Nevada, vehicle collisions with wild and domestic/feral animals result in more than 500 reported crashes, cost the Nevada public over $19 million in crash costs, and kill an estimated 5,032 wild animals.... 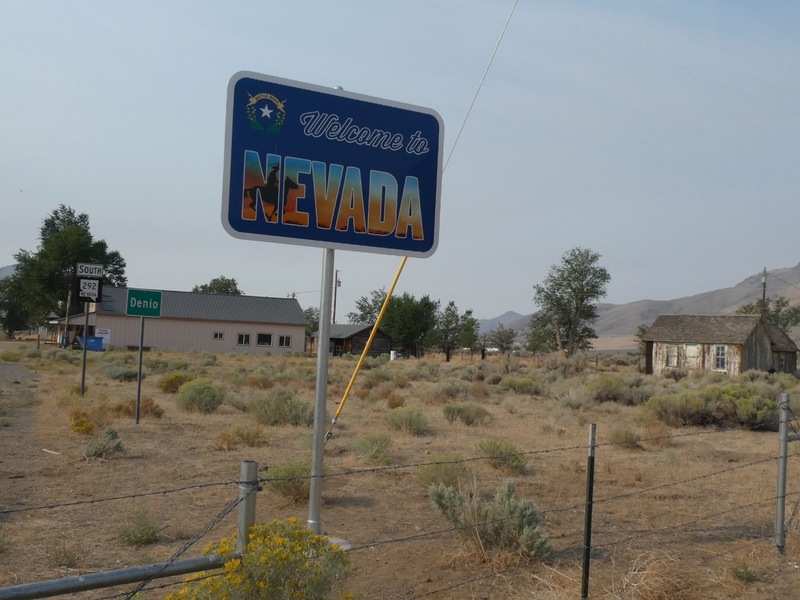 In a continual effort to provide the safest roadways, the Nevada Department of Transportation and partners such as the Federal Highway Administration, U.S. Fish and Wildlife Service and Nevada Department of Wildlife are installing safety crossings. 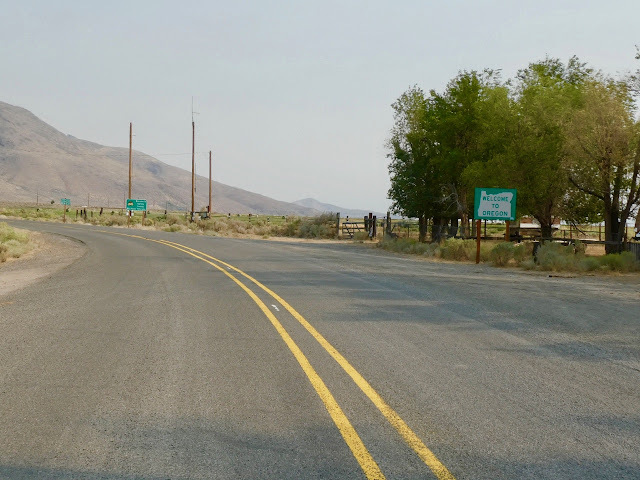 Research on Nevada's Elko county highway 93 overpass claims traffic fatalities were reduced by 80%. Crossing into Utah, the brown and tawny colored earth shifted mineral composition. If the temperatures hadn't been in the 90s, we might have thought we were traveling through snow. Eventually as we approached the vast Great Salt Lake, salt crusted the water's edge like rock salt gone amuck on a margarita glass rim. 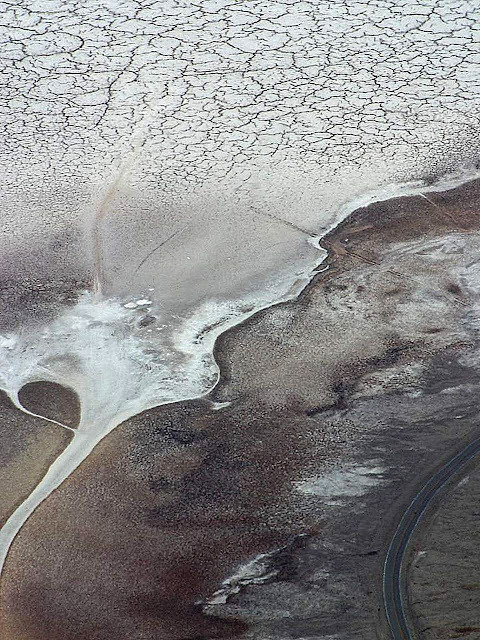 Salt crystals and gypsum cast a snow-like landscape across Utah's arid Salt Lake area. This image was pilfered from Pixnio. We drank in the scenery at high speed; even if we'd wanted to pull over to snap a scenic shot, there were no scenic overlooks we could access easily just off the highway. The Great Salt Lake. 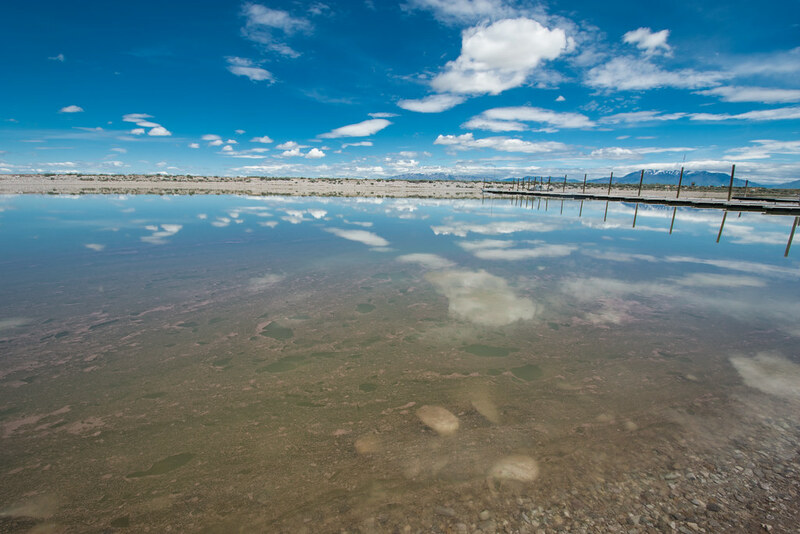 This 1,700 square mile, prehistoric lake once covered most of Western Utah. The same lack of scenic overlook dilemma continued as we sped through the Bear River Mountains, the Northern tip of the Wasatch Mountain Range, and the Western portion of the Rocky Mountains. Wasatch Mountains.... Image liberated from Wikipedia. It was dusk as we rolled our stiff, road-weary bodies out of the car into SleepInn, in the crowded South Jordan burbs of Utah, relieved with a gorgeous view of the Wasatch range. We supped at the R&R BBQ next door, chock-a-block full of kids, not surprising in the heart of Mormon country. Despite overstuffing ourselves, we waddled out with plenty of leftovers for the next day's travel. We are currently settling into Palm Bay, Florida. 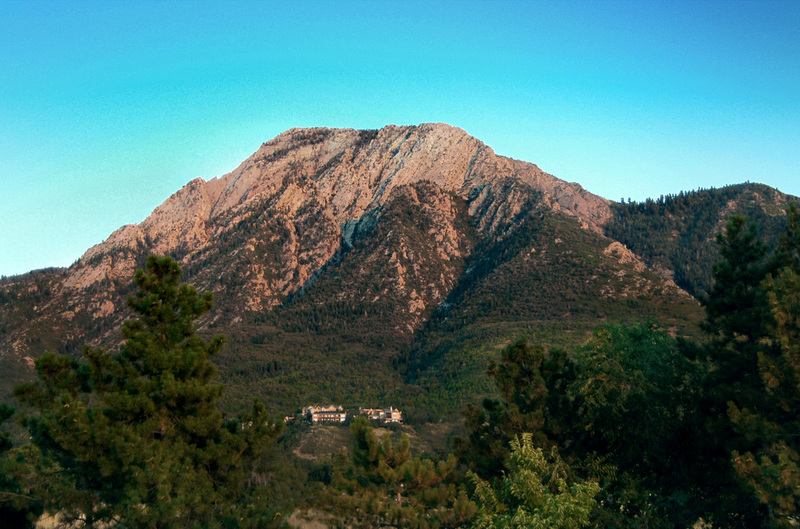 This post is a retrospective of our recent cross-country drive here. This post particular post covered our travels on September 10, 2018. More to come. Rainbow over saw palmettos across from Coconut Point Beach Melbourne, Florida. Site of the monthly 1st Saturday beach cleanup.